It’s not everyday you see a man butcher a whole hog with his bare hands. About a hundred carnivores watched Fatted Calf owner Taylor Boetticher take apart a 180-pound hog pig just a hand-saw, cleaver and boning knife. The carnal demo went down at at gritty hipster bar Bloodhound on Tuesday Aug. 31 in the Mission district. 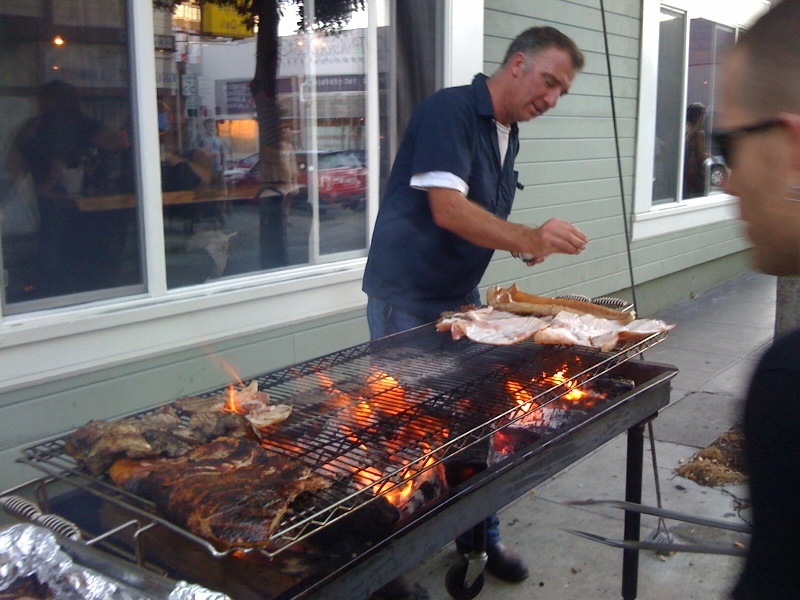 The artisan butcher is the man behind Fatted Calf Charcuterie in Napa. His CIA degree, passion for the food and business smarts has led him to open a location in San Francisco’s Hayes Valley this month. He opened the shop with his wife Toponia and a second business partner three years ago. 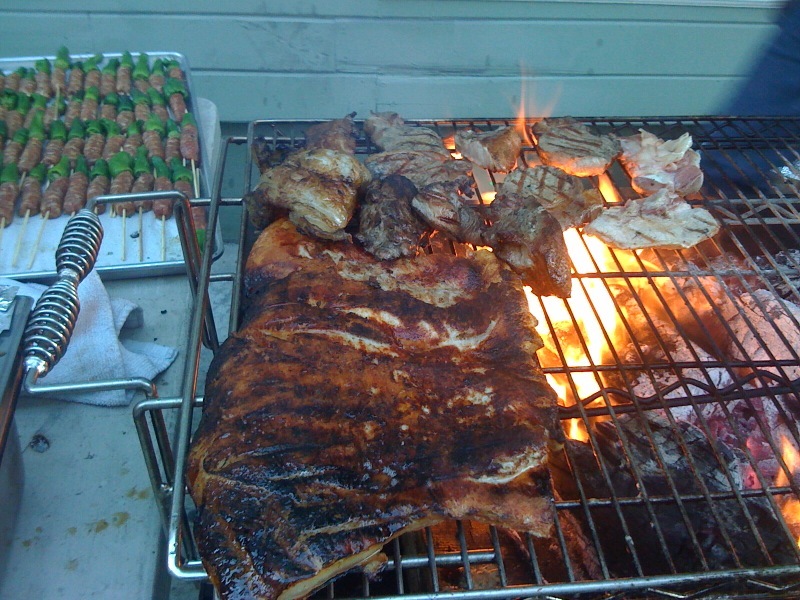 After the butchery demo, chefs grilled cuts of meat right in the alleyway. The crowd was a good mix of brawny men, sassy women with tats, and a good sprinkling of swine-loving foodies. They ate grilled pork out of Chinese to-go containers, served with either a salsa verde with capers parsley oregano garlic, salt – more like a chimichurri really – or spicy Moroccan harissa sauce. Mini banh mis (Vietnamese sandwiches) were also up for grabs, as well as fresh sausages on the stick. Then they washed it all down with beer in Bell jar glasses or the Kentucky breakfast – bacon-infused vodka with lemon juice, maple syrup and egg whites. And for dessert – bacon shortbread cookies! Scrumptious! Really. I promise. 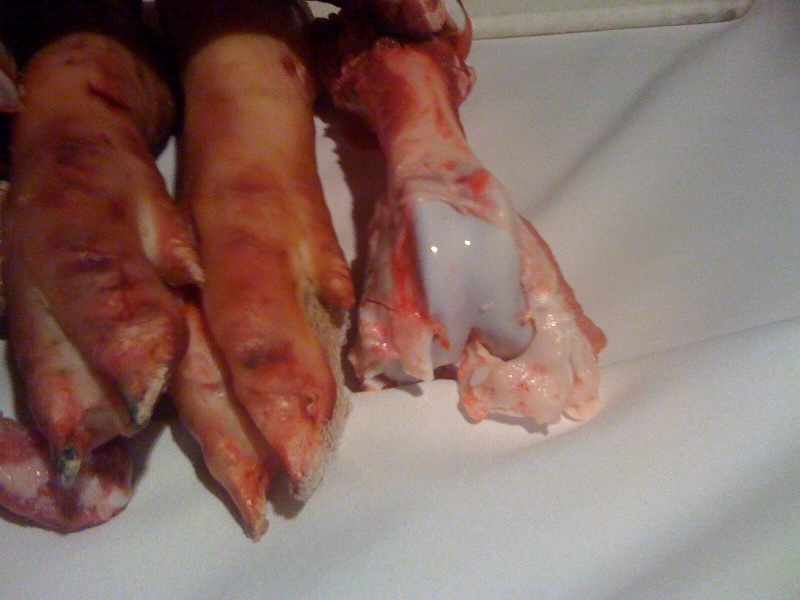 Fatted Calf has done a few foodie events at the Bloodhound before, with other fleshy offerings, like lamb and rabbit. The Wild West feel of the bar fits in perfectly with the butchery theme. 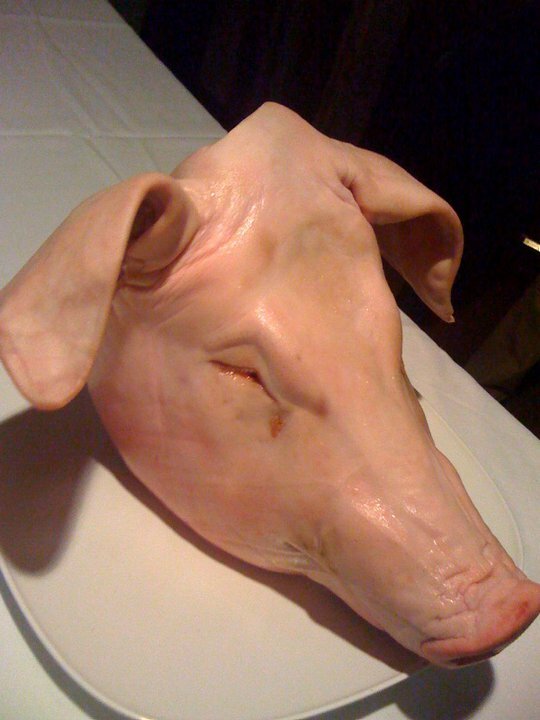 Chefs roasted every single part of the animal – the fat for pork rinds, and the face for meat and salami. And this little piggy..has found his new home! Fatted Calf is a classic French charcuterie, offering smoked pork chops, pasta, pates and foie gras. They have 16 varieties of pate alone! They served mini Vietnamese banh mis sandwiches with their house-made pate. San Francisco residents can soon enjoy all of Fatted Calf goodies every week with the new Hayes Valley store. While you’re waiting for the new store to open, and can’t make it out to Napa, Fatted Calf is also at the Ferry Plaza Farmer’s Market in SF and Berkeley Farmer’s Market every Saturday, on Center Street between Martin Luther King Jr. Way and Milvia.